3. Display modes of B, B+B, 4B, B+M and M have been designed, and its image grayscale is 256. 4. The display of fixed characters, real-time clock and date is available. 5. Touch keyboard and mouse operation make this palm smart veterinary ultrasound scanner easy, convenient, and flexible to operate. 6. With portable plastic shell, no-frequency transformer switch power supply, programmable components and SMT, this digital palm smart veterinary ultrasound scanner is of high automation degree, small size and light weight. 7. It's an ideal choice for animal medical treatment and diagnosis. 8. Its weight is only 1.3KG. 9. Its interchangeable probes can offer a wide range of diagnostic applications. 10. 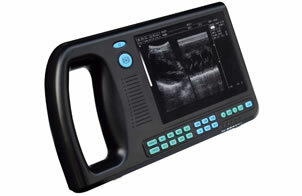 This veterinary ultrasound scanner is a cost effective solution for family doctors and veterinary scanning. 11. Complete software and high product versatility are also available. 12. Its standard configuration is C2-7/20R/5.0MHz micro-convex probe, and its optional configurations include C2-6/40R/3.5MHz frequency convex-array probe, LV2-2/6.5MHz frequency rectal probe, and EL2-3/7.5 MHz frequency rectal probe. 1. Its scanning method can be convex, micro-convex and linear array. 2. Its scanning depth is no less than 80mm, and it is multi-level and adjustable. 3. The dimension of its monitor is TFT LCD (Liquid Crystal Display) of 6.4 inch. 4. Its display modes are B, B+B, B+M, and M.
5. The grayscale is 256, and its image permanent storage is 32 frames. 6. The video playback is more than 200 frames. 7. Its image processing includes up and down, left and right, \black and white, gamma correction, and pseudo-color processing. 8. This scanner can measure the distance, circumference, area, heart rate, gestational weeks, expected date of confinement, and fetal weight. 9. Its character display includes date, medical record number, age, gender, focus combination, and frame correlation coefficient. 10. Its power supply mode is direct current supply and battery. We are a professional manufacturer and supplier of digital palm smart veterinary ultrasound scanner in China. This veterinary ultrasound scanner is a cost effective solution for family doctors and veterinary scanning. We can also provide other products to our clients, such as 3D ultrasound scanner, ultrasonic diagnostic system, laptop ultrasound scanner, etc. We provide one-year maintenance and life-long service are both available for clients at home and abroad. And our products have received the certification of CE and ISO. Our products have been well received by customers from many countries, such as Syria, Kazakhstan, Kyrgyzstan, India, Pakistan, Iran, Vietnam, Indonesia, Britain, Germany, Italy, Sweden, Romania, South Africa, Egypt, Ecuador, Uganda, Bolivia, Paraguay, Uruguay, Mexico, the United States, Canada, Argentina, Peru, etc. If you're interested in our digital palm smart veterinary ultrasound scanner, please don't hesitate to contact us whatever you want.